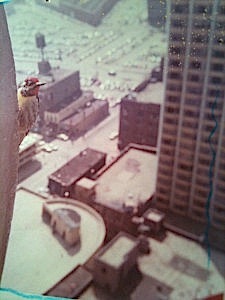 Years ago, you’re in an office on the 26th floor of a Chicago skyscraper, doing work profoundly unrelated to nature. You have the feeling of being watched. You look over your shoulder. On the other side of your window there’s a Yellow-bellied Sapsucker, clinging to the building, meeting your gaze. The bird had picked your window. Not the window of some guy who wouldn’t know a sapsucker from his elbow. You grab a cheap throw-away camera and get a picture. The shot is poor. Dark and fuzzy. You find it recently, while cleaning out a desk. Back when you saw the sapsucker, you had the momentary feeling that it sought you out, personally. Looking at the old picture, you still wonder about that. But you shake off the thought. You just chalk it up to the simple truth that sometimes you watch the birds, and sometimes they watch you. This entry was posted on Tuesday, February 25th, 2014 at 5:09 pm	and is filed under "Daily Sightings" A Blog. You can follow any responses to this entry through the RSS 2.0 feed. You can skip to the end and leave a response. Pinging is currently not allowed. Thufferin’ thassafrass, a Yellow-Bellied Thapthucker! From birds perspective; A group of 12 birders moving, stopping, and peering about; A step up from cows, out & about ? The photo looks nice, nice for a coffee mug . memories of a long-ago friend who, on a lark, decided that he’d lay on his back in a grassy pasture in vulture country just to see what would happen. Later, I asked him what how it had gone. He said that a couple of vultures spied him and, sure enough, they began circling him for awhile. “Well . . . eventually, they landed and . . . ate me,” he said, matter of factly. Now, I ask you: Why am I so seldom around when the best Kodak moments occur? It’s just not fair!